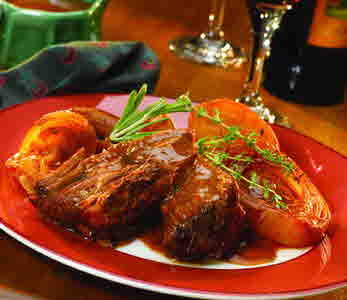 Trim fat from beef roast, if necessary and place roast in bottom of 5 to 6-quart slow cooker. Spread horseradish over surface of meat. Top and surround roast with onions and potatoes. Sprinkle with thyme and rosemary and pour in tomato juice and beef broth. Place lid on slow cooker and cook on high setting for 6 to 8 hours or until beef is fall apart tender. Fifteen minutes before serving, mix wine (or beef broth) with flour. Pour mixture around the meat in the slow cooker. With a spoon, gently stir the flour mixture into existing sauce without disturbing the meat. Replace cover and cook on high setting for 15 minutes or until thickened. Before serving, season with pepper and salt to taste.